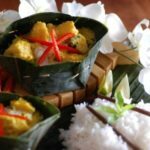 Trey Amok considered to be Cambodia’s national dish is a lovely steamed fish curry that is typically steamed in banana leaf. 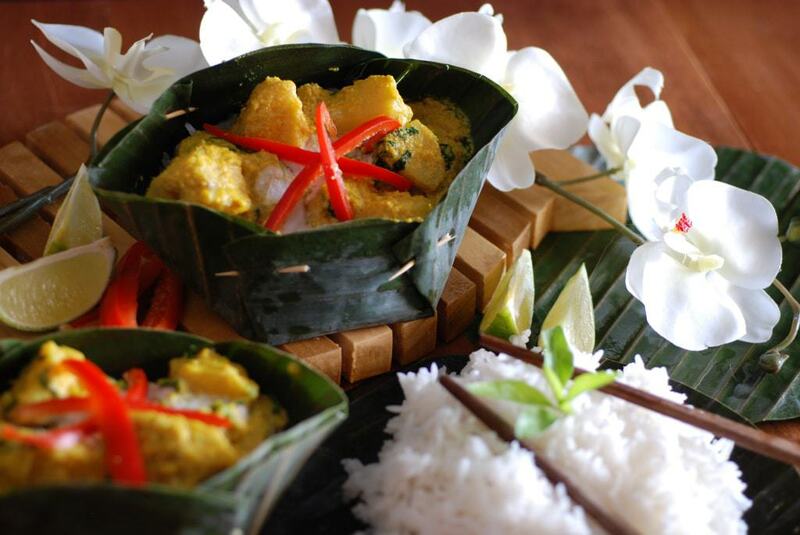 This recipe is made in one pot and placed in a banana leaf boat for presentation. The result is pretty darn close to the real thing. This classic trey amok dish is served with steamed white rice for a fantastic meal. This recipe utilized the technique of making a paste using a mortar and pestle, which is used quite a bit in Khmer cuisine. If you would like to learn more about Cambodia be sure to check out “Our Journey to Cambodia” plus there you can find some more authentic recipes. 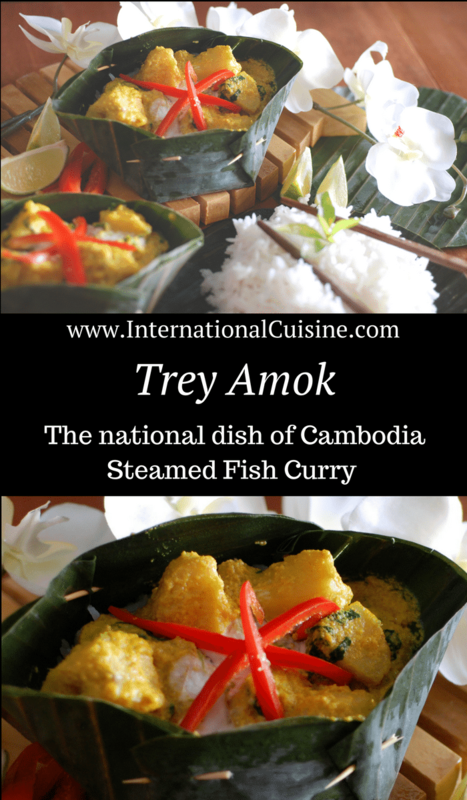 Trey Amok is the national dish of Cambodia. It is easy to see why a lovely steamed fish curry! 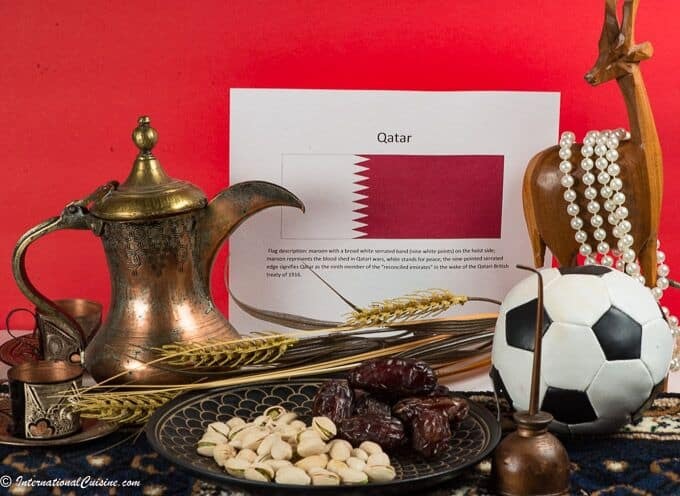 Place the first 5 ingredients in a mortar and pestle and pound to a paste. Add the remaining ingredients and pound or process until all spices are well incorporated. Thinly slice the fish into ½-inch thick bite size pieces and set aside. Heat the oil in a saucepan over medium-high heat. Add the curry paste and cook for 1 minute. Add the shrimp paste, coconut milk, sugar and salt, whisking to combine. Turn the heat to medium and simmer for 2 minutes, whisking occasionally. Add the fish and spinach leaves, gently folding the fish into the curry sauce with a wooden spoon or rubber spatula. Let the amok simmer for 3 to 4 minutes, or until the fish is just cooked through. Turn the heat off. In a small bowl, whisk the egg with the fish sauce and 2 tablespoons of the curry sauce from the pan. Pour the egg mixture into the saucepan and gently fold it into the curry. To make a banana leaf bowl, cut out a circle about 7 inches and using a toothpick secure four sides to make a bowl. Serve the amok in a banana leaf bowl with a spoonful of coconut cream (the thick cream that rises to the top of the remaining coconut milk), a few sliced red pepper pieces and a sprinkling of kaffir lime leaf ribbons or lime zest.